2014-2015 HASTAC Scholar Bradley Cavallo shares some details regarding his newest digital project. Returning from a research trip abroad in the Summer of 2014, I faced the entwined problems of how to organize so as to understand my information. In this case, what I had collected consisted of hundreds of photographs documenting artworks in Rome. These portraits exist throughout the city, and with each one went transcribed Latin inscriptions that detailed to a greater or lesser extent the identity of the individual portrayed and when they had lived. All together, then, I possessed an unwieldy number of images and texts. In an initial attempt to schematize this body of information, I listed all of the artworks based upon where I had found them, the approximate dates of their creation, etc. as part of a simple Microsoft Word document. An ad hoc color-coding system enabled me to see in a vague way the chronological range of the data (i.e. that these artworks had been created between the sixteenth and nineteenth centuries, and that a great proportion of them had been painted with oil paints on stone slabs and metal plates). Tickling the back of my mind, a memory existed in which a colleague of mine named Danielle Abdon Guimaraes suggested that I investigate something called Omeka. To my current chagrin and for reasons unknown even to myself, I procrastinated in pursuing her advice. And yet, when the opportunity arose in late August to apply for a Digital Humanities Scholarship, I immediately recalled Danielle’s advice and her presentation of the prior Spring concerning a digital reconstruction of many hundreds of years of urban development in Venice, Italy. With her project in mind, it seemed to me that the Digital Humanities could potentially offer a meaningful manner in which to learn how to do something with all of the information that I had accrued. I applied, and was thankfully accepted. Admittedly, I was a newcomer, a neophyte to the idea and practice of the Digital Humanities. I had long used Microsoft Powerpoint and the whole suite of software products available to a PC user for the purposes of writing papers and making presentations for my art history classes. But what Danielle had done, and what I hoped I myself might do, represented something more complex, and (in retrospect) accordingly rewarding. To be clear: I knew nothing. I had no real clue what lay ahead of me, other than a tingling sensation, a hunch, an intuition, that an art historian could do a lot by digitizing art historical information. Surely, that’s what the discipline had been doing all along? If not digitizing, then surely we’d long been visualizing artworks the world over. Pace Walter Benjamin, exciting students and conveying complex visual iconographies embedded in culturally-specific contexts to them depends on our reproduction of the work of art. 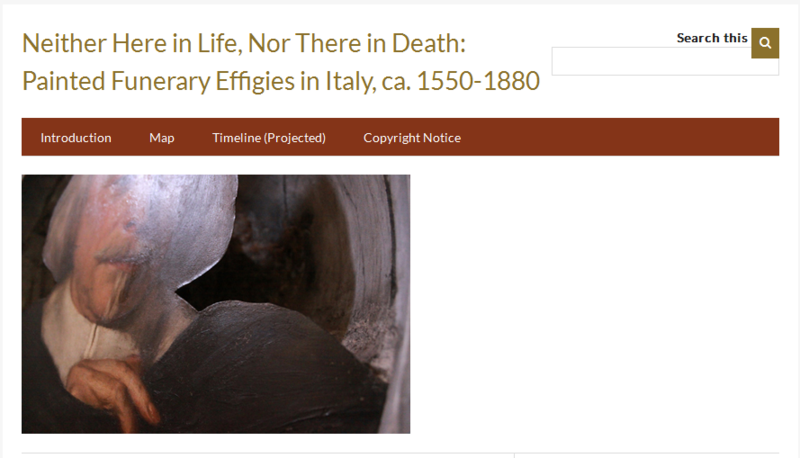 The introductory page to the Omeka webpage: Neither Here in Life, Nor There in Death. Over the course of my time participating with the Digital Humanities Scholarship program, I gradually came to understand the possibilities of various software and internet-based platforms like (you guessed it) Omeka. Because of the tutelage that I received from September, 2014 to April, 2015, I employed Omeka to create a website that has helped me to organize and display in a superior way what I had documented and obtained in Rome. In this presently basic way, the Digital Humanities served me well, and suggests a mode of presenting and describing artworks verbally and visually to as many audiences as can be attracted. Subsequent conversations with Danielle about Digital Humanities have revealed some interesting ideas and uncertainties. What, for example, research questions can a fully digitized or visualized art history project help to ask, let alone to answer? Will it be possible to utilize Digital Humanities to create a fully visual experience of art historical data without the necessity of verbal descriptions or explications? Exploring these, and other, questions will aid art history develop itself as a practice of historical inquiry, making it potentially less parochial and more collaborative. Is Digital Humanities the future of art history?